The great Canadian real estate bull market has pushed home prices to dizzying heights over the past two decades. And with ever-rising prices it has sucked in more capital and resources creating an almost self enforcing feedback loop, where an entire economy has become dependent on rising house prices. This misallocation of capital and resources is particularly well documented in the labour force where every year the number of realtors, mortgage brokers, and homebuilders seems to grow exponentially. Per Stats Canada, the share of employment tied to construction as well as finance, insurance and real estate is nearly two standard deviations above its long-term average. I’m no economist but somehow it seems building an economy dependant on selling each other more expensive homes is probably not the greatest long term growth strategy. 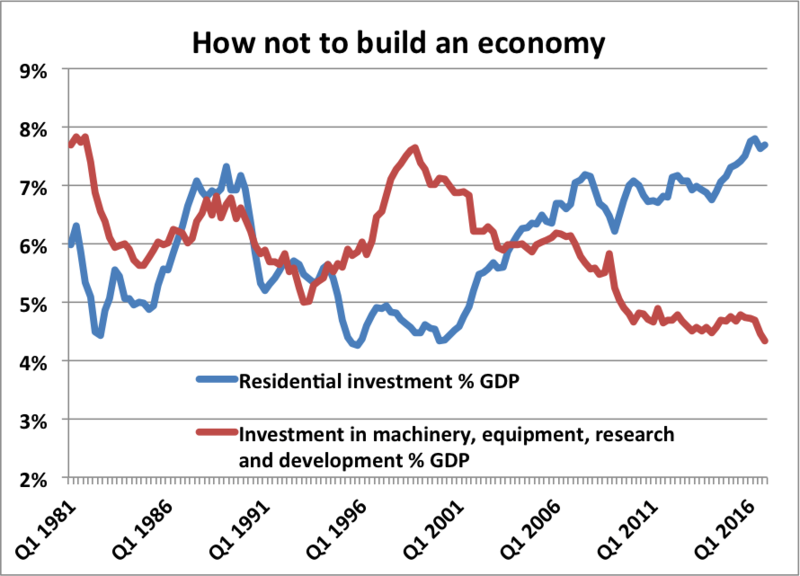 To illustrate this point we can see here that residential investment as a percentage of GDP now outpaces investment in machinery equipment research and development. Currently there are over 55,000 new homes under construction across BC, with a record high number of housing starts also underway. This has created a massive shortage in the trades sector, while sending construction costs and house prices higher. However, with the real estate market across BC now beginning to slow, particularly in greater Vancouver, which saw housing sales across all property types drop to a 17 year low, early indications suggest a potential difficult transition may be underway. 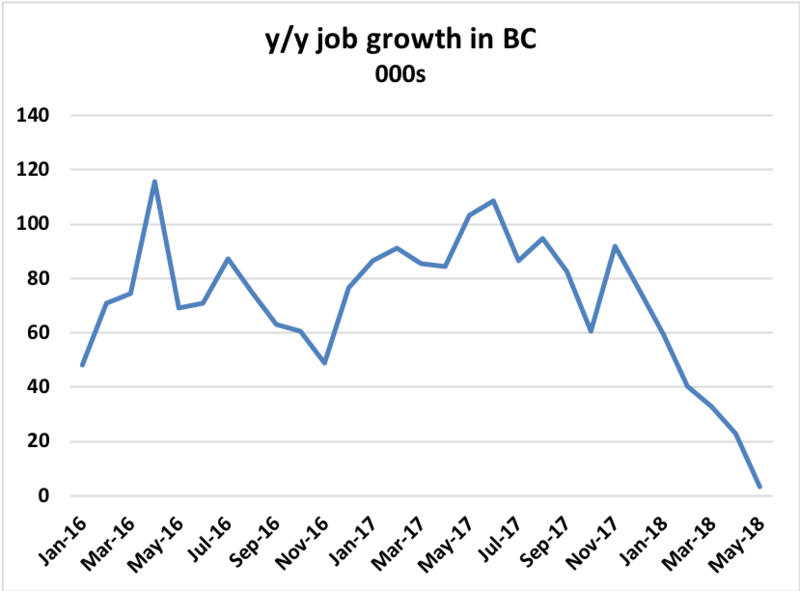 With the help of Ben Rabidoux of North Cove advisors, we can see that job growth in British Columbia is been in a funk in recent months. For simplicity sake, we can estimate how this would affect the real estate broker space, where real estate commissions now command 2% of Canadian GDP. Through the first four months of 2018, British Columbians have spent nearly $2 billion less on residential real estate. 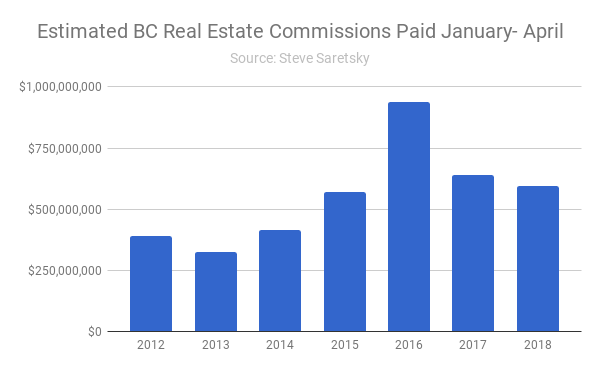 Assuming the typical real estate commission of 3%, this would equate to a 7% reduction in total commissions paid, not too bad. However when comparing to the boom year of 2016, real estate commissions decreased by 36.4%. Real Estate commissions estimated based on total dollar volumes spent. While it’s still early to say how this all shapes up, recent polices which have been put in place are all aimed at cooling the real estate sector. This will undoubtedly create a difficult transition period for some workers. 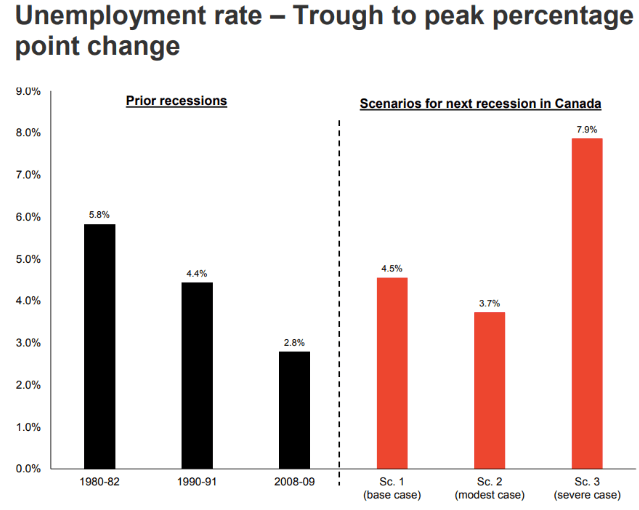 Macquarie research believes the best-case scenario is that the fallout, starting in 2020, will be as bad for Canada as the 2008-09 financial crisis. Worst case: The unemployment rate will spike by more than any recession since the Great Depression.